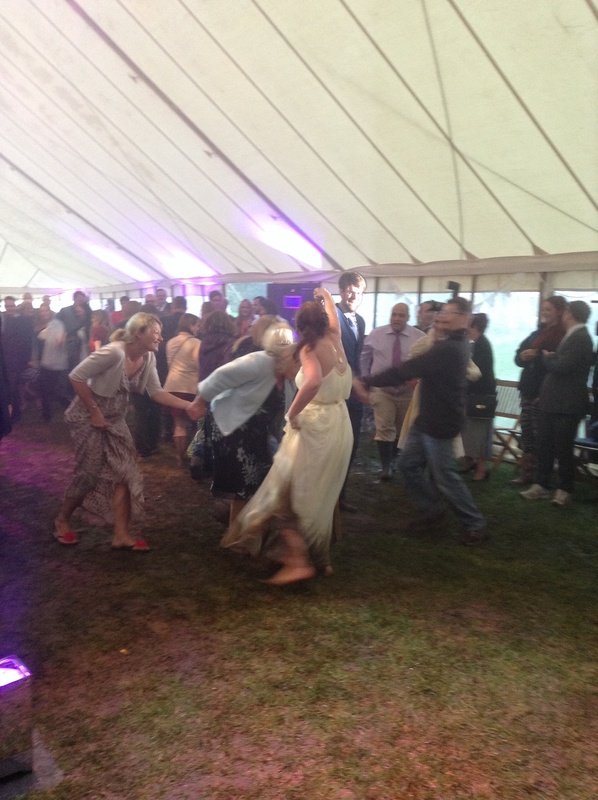 Saturday saw us back at the beautiful Brook Farm in Cuffley for Sarah Jane & Matt’s festival style wedding. Unfortunately the weather wasn’t kind, but the rain and wellies just added to the perfect look & feel of the day! 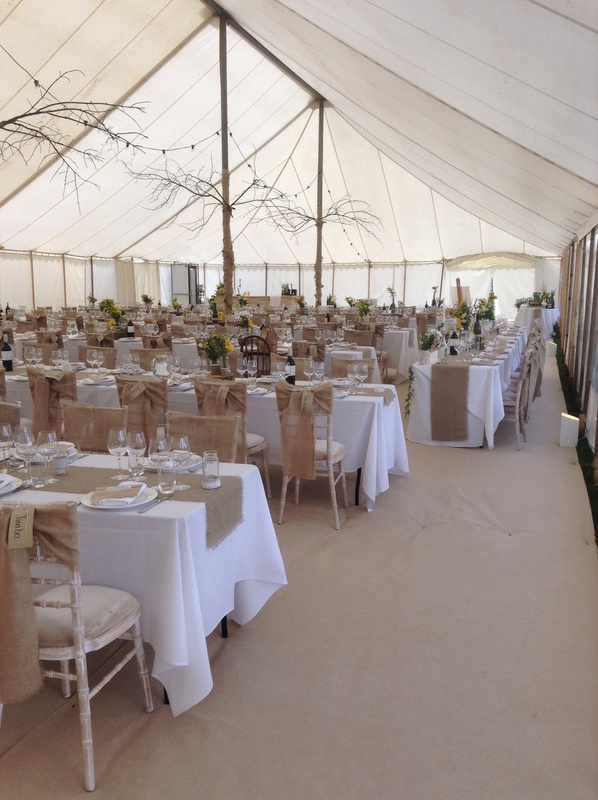 The marquee was complete with a huge stage, strobe lighting and bunting. The floor was even left as grass. Lots of greenery and deck chairs completed the look! They arrived in an old MG, Sarah Jane in a beautiful flowing cream dress complete with bare feet, who really cared about the rain! 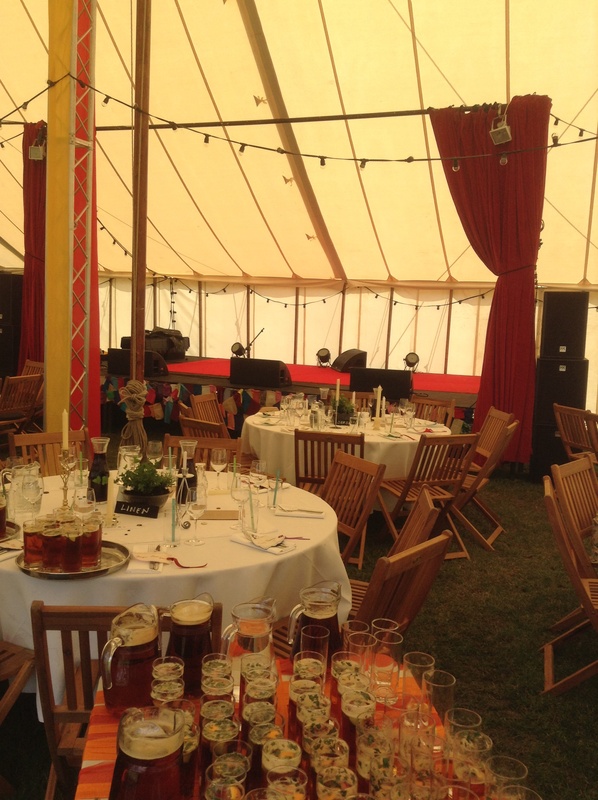 Guests arrived to glasses of Pimms & homemade sandwiches, then feasted on a hog roast and salads, toasted to a homemade elderflower champagne, and finished on a pork pie wedding cake, delicious, perfect festival food & drink. After dinner the band played late into the night and the guests danced & danced, I even think everyone forgot about the thunder & rain happening outside! 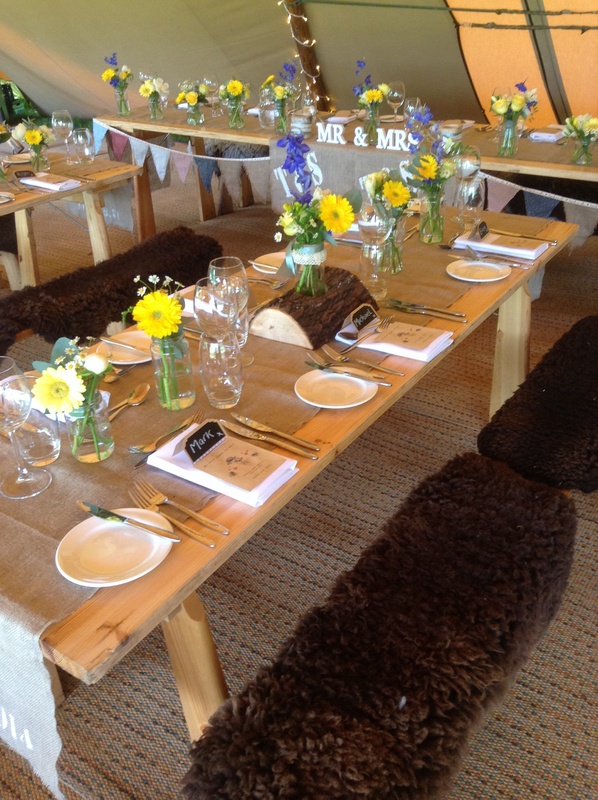 Lovely day had by all, we so enjoyed being part of it, we even served in our wellies! Happy Couple, Tipis & Sunshine! Perfect! We had a fantastic day yesterday for Sally & Terry’s wedding. 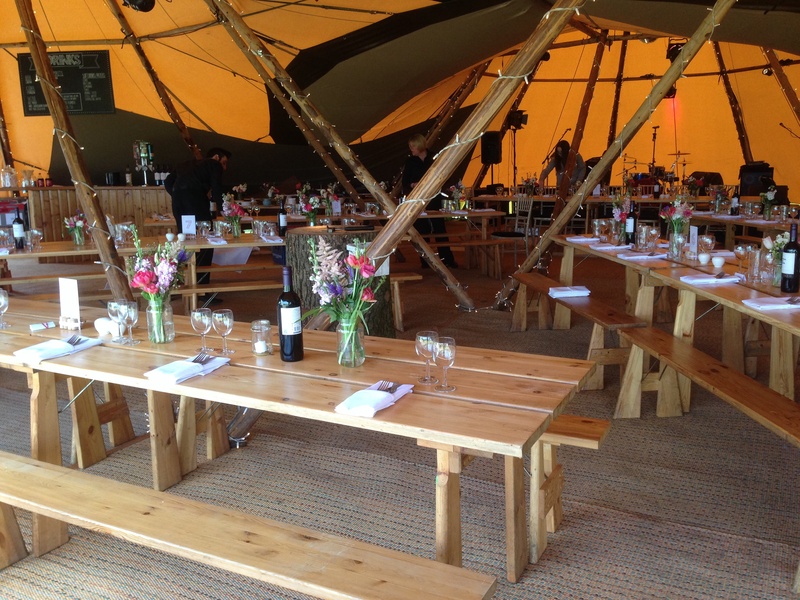 Tipis set at the top of the hill at North Hill Farm, Chorleywood, overlooking beautiful rolling countryside. 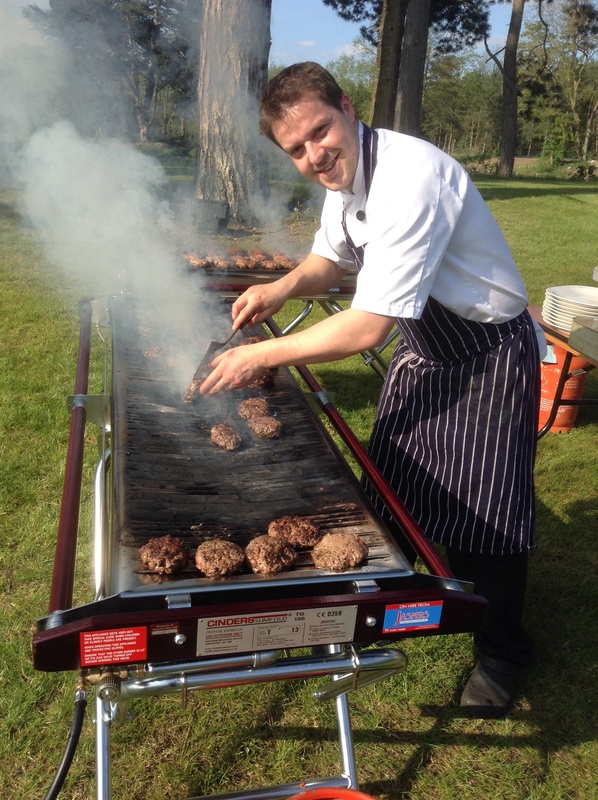 The sun shone, the champagne flowed and the food was delicious! 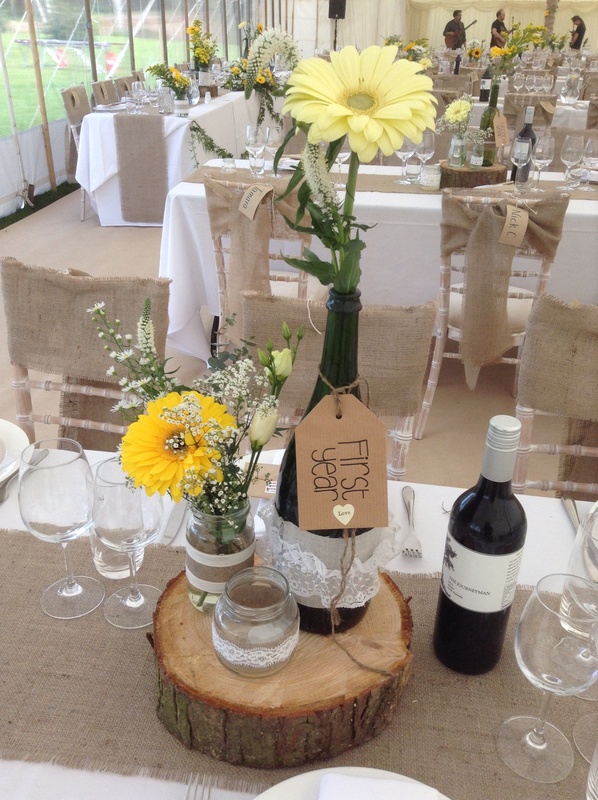 The Tipi was dressed with loads of wild flowers and tree stumps which accentuated the country theme. with hay bales and a bonfire lit after dark it was the perfect rustic setting. 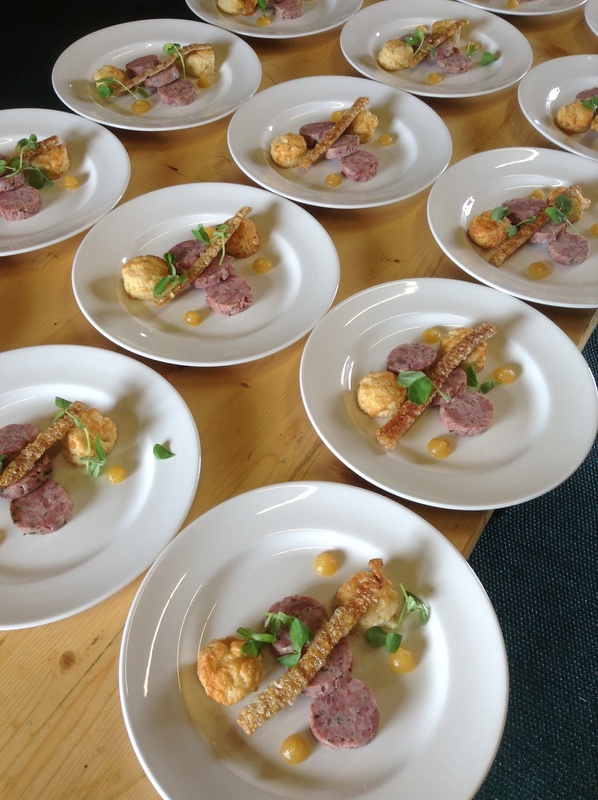 Their chosen menu was Ham Hock Terrine, Mini Cheese Scones, Candied Apple Purée & Salted Crackling followed by Lamb Kleftico, Roasted Baby Potatoes & Greek Salad. Dessert was a trio of Sticky Toffee Pudding, White Chocolate and Hazelnut Blondie, Summer Fruits Eton Mess, Blossom Honey, Strawberry Shortbread. Delicious! After the meal we moved all the tables out into the early evening sunshine for the guests to relax and enjoy the view. With dancing to a live band, a huge chocolate fountain and a bonfire ended the perfect day! Oh! 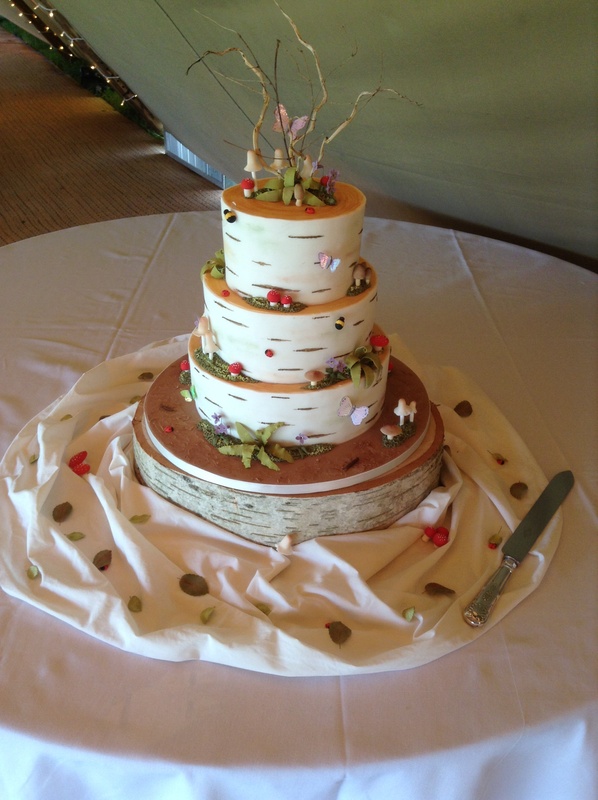 And what a fantastic cake! 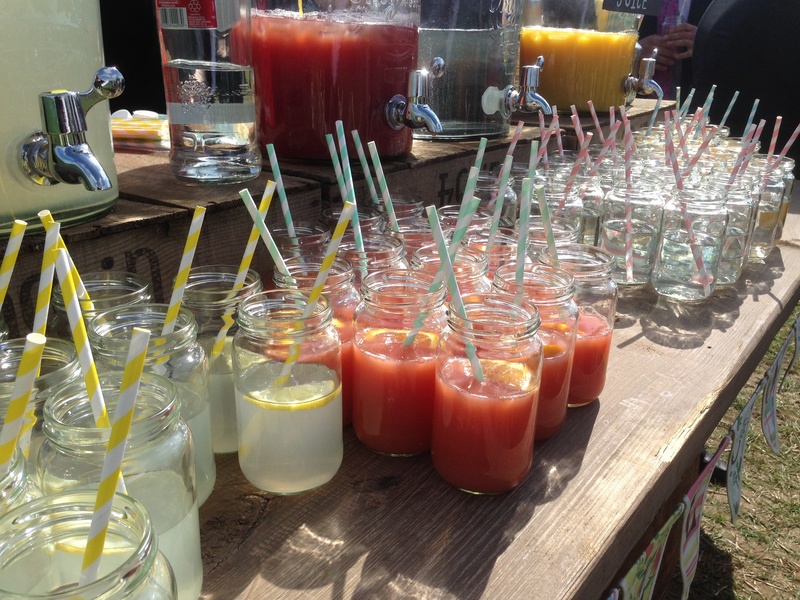 Double wedding weekend in the Hertfordshire sunshine! Saturday saw a busy weekend for the KF team! First double wedding day of the season with big numbers to cater for, but both I’m pleased to say, were a great success! 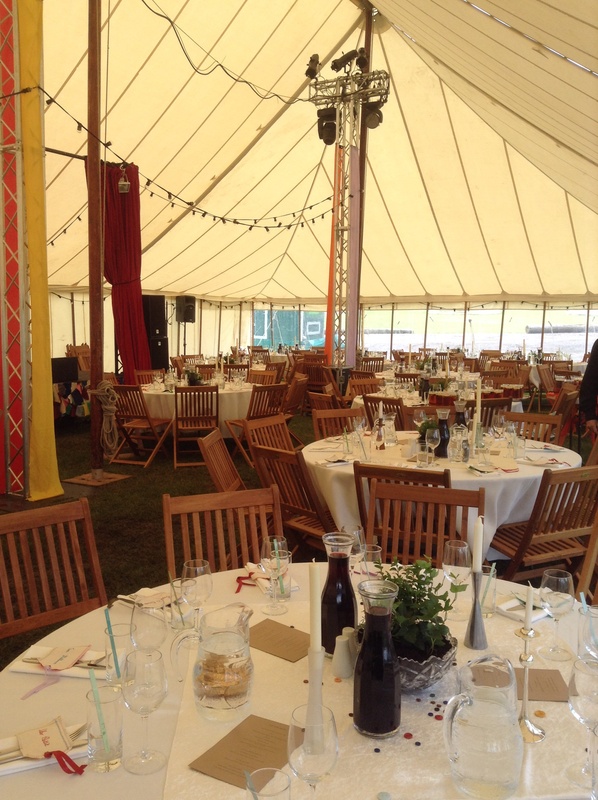 Ian led team 1 for Hannah & Thom’s wedding at Bayford Hall Farm for 127 guests in the beautiful Tipis. Arrival cocktails, Gin & Elderflower Sherbert & Madras with a selection of canapés welcomed the guests upon arrival. Kingfisher signature Slow Roast Hog followed served with bowls of salads & potatoes, finished off with their wedding cake, made it a perfect meal. The Tipi rocked the night away to a Madness tribute band, playing not only ‘one step beyond’ but many 80’s tunes. It was encore after encore! 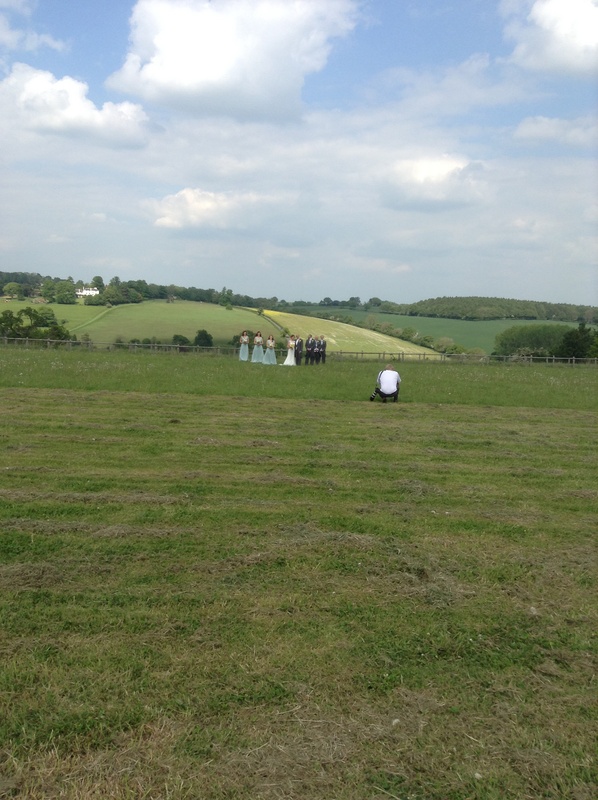 Team 2 were at the beautiful Brook a Farm for Heidi & Nick’s wedding. Laying up in the rain on Friday no one could of predicted just how beautiful the day would turn out! The marquee looked beautiful but not as beautiful as the bride and her bridesmaids, all in light olive green, they complimented the decor beautifully. Champagne and canapés for arrival, followed by Kingfisher BBQ of Beef & Sun-blushed tomato burgers, Piri Piri Chicken Skewer, Haloumi Cheese & Vegetable Skewer, served with Cajun sweet potato wedges, baby new roasted potatoes, Greek Salad, vine tomato, baby mozzarella, red onion & rocket pesto salad. Delicious! 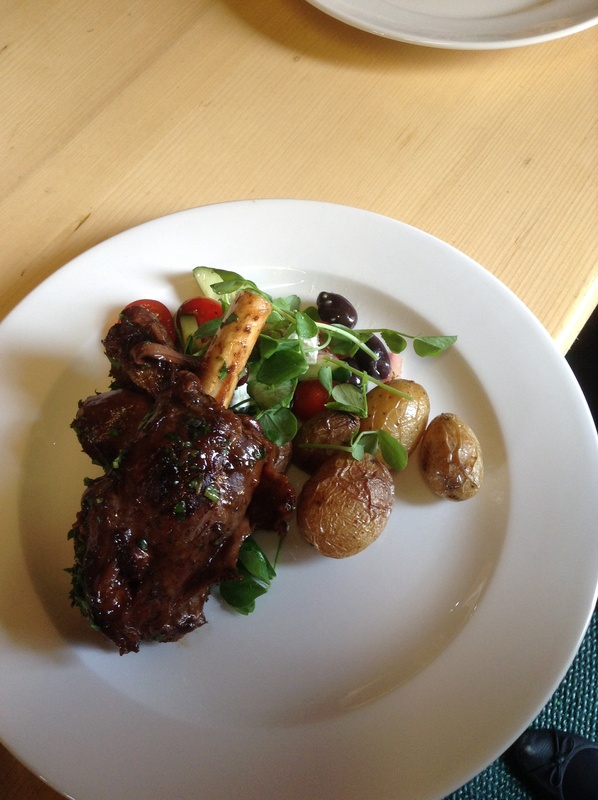 Cooked to perfection by our lovely John! Desserts made by family & friends followed by a lot of dancing, helped along by drinks flowing from the bar! Great day had by all, Well done everyone for helping to make both days a big success, especially our ‘newbies’ Dan, Anna, Chloe, Anton, Toni, Helen, Georgia and Emma!